Industrial Kit K.TXH440 has a Total Retail Value of $460. This heavy duty model has exactly the same motor specifications as the M.TX. 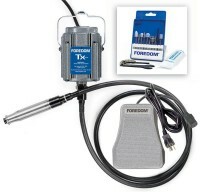 Series TX motors are Foredom’s most powerful flex shaft machines with 1/3HP. They have permanent magnet DC motors that feature the latest in flex shaft technology. These ball bearing models utilize advanced rare earth magnets (in place of the wound fields in our universal type Series SR motors) that deliver more torque at the low end and throughout the entire speed range of 500 to 15,000 RPM. This model comes equipped with a motor bale for hanging, and a 63″ long, square drive shaft and heavy duty protective sheath in place of the standard key-tip shaft and sheath. Heavy duty shafts and sheaths can ONLY work with Foredom’s four square drive handpieces- the H.25H, H.30H, H.44HT and new H.28H. Heavy duty flex shafts are the ultimate power tools for deburring, buffing, grinding, polishing and metal finishing of any kind with larger rotary accessories. They are great for large scale woodcarving and sculpting applications with carbide or steel burs and larger mounted grinding stones. Foredoms permanent magnet motors require the use of a C.TXR, C.SXR, or C.EMX speed control. Damage will result if the motor is connected to any other speed control. The C.SXR looks the same as our standard metal foot operated control but it has special electronics that converts AC current from an electrical outlet to DC current, the type required by Series TX motors. This control also has a different style plug that is made to fit the motor’s shielded-type plug. The C.SXR features solid state circuitry in a cast iron housing. The added weight eliminates any unexpected movement of the control along the floor. The bottom surface of the speed control is covered with non-skid material. CSA listed. 6-3⁄4″ long, 4″ wide, 2-3⁄8″ high, ship wt– 6 lbs./2.7 kg. 3. H.44HT Handpiece: This special square drive, collet style handpiece is for exclusive use with our Series TXH, SRH and LXH heavy duty flex shafts. It comes with 3/32″, 1/8″ and 1/4″ collets. The tapered design allows for close and safe work. This handpiece is specialized and is NOT a member of the Foredom system of “interchangeable” handpieces. 4. AKHK25: This 10-pc accessory kit includes 2 aluminum oxide points, 2 CeramCut Blue stones, 1 carbide bur and 5 different mandrels fro grinding wheels and cartridge rolls. All with 1/8″ shanks. 5. Flexible shaft grease and spare motor brushes. This is great if you want a second machine or have all the bits and just want the machine. 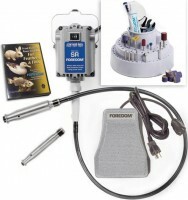 It comes with a SR machine, Plastic foot Pedal and 44T handpiece NOTHING ELSE. This collet style handpiece is popular among woodcarvers as it accomodates larger accessories with shank diameters up to 1/4″. It comes with 3/32″, 1/8″ and 1/4″ collets. The tapered design allows for close and safe work. The H.44T is a member of the Foredom system of interchangeable handpieces. 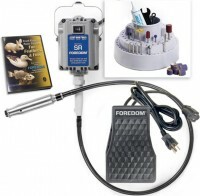 Foredom’s most popular and best motor for general use. The 1/6 hp, ball bearing, hang-up style M.SR runs in forward and reverse at speeds up to 18,000 RPM. It offers substantially more power than any of our older universal motors – 66% more than Series CC and 33% more than Series S and old SR motors. It comes equipped with a motor bale for hanging, and our standard 39″ long key-tip inner shaft and outer sheath for connecting to any of Foredom’s 19 interchangeable handpieces. Foredom’s most popular foot operated speed control. It has solid state electronics and comes in a heavy duty plastic housing with an extra wide design. 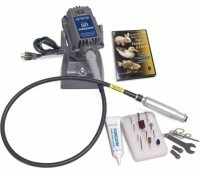 Woodcarving Kit K.5400 has a Total Retail Value of $556. Motor and Speed Control carry a 2 Year Warranty. Foredom’s most powerful flex shaft machines with 1/3HP. They have permanent magnet DC motors that feature the latest in flex shaft technology. These ball bearing models utilize advanced rare earth magnets (in place of the wound fields in our universal type Series SR motors) that deliver more torque at the low end and throughout the entire speed range of 500 to 15,000 RPM. No other flex shaft gives you greater control of the cutting tool, drill, or bur under any load. 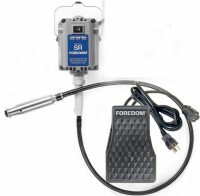 It comes equipped with a motor bale for hanging, and our standard 39″ long key-tip inner shaft and outer sheath for connecting to any of Foredom’s 20+ “interchangeable” handpieces.Foredom’s permanent magnet motors require the use of a C.TXR, C.SXR, or C.EMX speed control. Damage will result if the motor is connected to any other speed control. The C.SXR looks the same as our standard foot operated control but it has special electronics that converts AC current from an electrical outlet to DC current, the type required by Series TX motors. This control also has a different style plug that is made to fit the motor’s shielded-type plug. The C.SXR offers the same electronics and smooth control as the C.TXR but in a much heavier, cast iron housing. The added weight eliminates any unexpected movement of the control along the floor. The bottom surface of the speed control is covered with non-skid material. CSA listed. 6-3⁄4″ long, 4″ wide, 2-3⁄8″ high, ship wt– 6 lbs./2.7 kg. 3. H.44T Handpiece: This collet style handpiece is popular among woodcarvers as it accomodates larger accessories with shank diameters up to 1/4″. It comes with 3/32″, 1/8″ and 1/4″ collets. The tapered design allows for close and safe work. The H.44T is a member of the Foredom system of interchangeable handpieces. 4. AKWK53 Accessory Kit: 26 pc. assortment with 3/32″, 1/8″ and 1/4″ shank accessories. It includes many unique items from Foredom- ScotchBrite Radial Bristle Discs, Purple Ceramic Sanding Bands and Discs, Typhoon Burs, V Stones, CeramCut Blue Stones, and more. 5. Fur, Feathers, and Fins: 3 disc DVD set with in-depth instruction for beginning woodcarvers as well as detailed tips for more advanced power woodcarvers who want to enhance their technique. Filmed at the Vermont studio of renowned carver, Frank Russell, Fur, Feathers, & Fins shows the many steps involved in bringing simple blocks of tupelo wood to life. In over 3 hours of video material, Frank walks you through the set up of his work space, the tools he uses, safety concerns and lots more. He covers in great detail the carving of 3 different animal projects: A Cotton Tail Rabbit, Mallard Drake Duck, and Small Mouth Bass. Frank’s congenial manner and accomplished teaching style lend to the enjoyment of learning to carve. 6. Rotating Bur Holder for all size shank accessories plus bonus small round bur holder with lid. 7. Flexible shaft grease, spare motor brushes. Bench Style Woodcarving Kit K.5300 has a Total Retail Value of $434. Motor with Built-in Speed Control carries a 2 Year Warranty. Here a bench style version of Foredom’s 1/6 HP Series SR motor has an integrated dial speed control built into its cast-iron base for manual speed adjustment and easy placement anywhere on the workbench. Foredom’s 1/6 HP, universal, flexible shaft machine runs in forward and reverse rotation at speeds up to 18,000 RPM. The M.SRM combines the most important features our customers expect–power, reversibility, reliability, and versatility– all into one motor. It comes equipped with our standard 39″ long key tip inner shaft and outer sheath for connecting to any of Foredom’s 19 interchangeable, quick disconnect handpieces. This collet style handpiece is popular among woodcarvers as it accommodates larger accessories with shank diameters up to 1/4″. It comes with 3/32″, 1/8″ and 1/4″ collets. The tapered design allows for close and safe work. The H.44T is a member of the Foredom system of interchangeable handpieces. 12 pc. 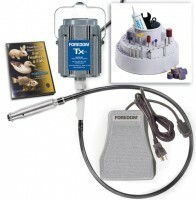 assortment kit with Typhoon and other carving burs. 3 disc DVD set with in-depth instruction for beginning woodcarvers as well as detailed tips for more advanced power woodcarvers who want to enhance their technique. Filmed at the Vermont studio of renowned carver, Frank Russell, Fur, Feathers, & Fins shows the many steps involved in bringing simple blocks of tupelo wood to life. In over 3 hours of video material, Frank walks you through the set up of his work space, the tools he uses, safety concerns and lots more. He covers in great detail the carving of 3 different animal projects: A Cotton Tail Rabbit, Mallard Drake Duck, and Small Mouth Bass. Frank’s congenial manner and accomplished teaching style lend to the enjoyment of learning to carve. 26 pc. assortment with 3/32″, 1/8″ and 1/4″ shank accessories. It includes many unique items from Foredom- ScotchBrite Radial Bristle Discs, Purple Ceramic Sanding Bands and Discs, Typhoon Burs, V Stones, CeramCut Blue Stones, and more. Woodcarving Kit K.5200 has a Total Retail Value of $546. Offers the same electronics and smooth control as the C.FCT but in a much heavier, cast iron housing. The added weight eliminates any unexpected movement of the control along the floor. The bottom surface of the speed control is covered with non-skid material. CSA listed. 6-3⁄4″ long, 4″ wide, 2-3⁄8″ high, ship wt– 6 lbs./2.7 kg. This is also a collet style handpiece that comes supplied with 3/32″ and 1/8″ collets. It has a very slender design and tapered front grip that is only 1/2″ in diameter. It can be held in a “pencil grip” fashion for very close work in hard-to-reach places. The H.28 is a member of the Foredom system of interchangeable handpieces.